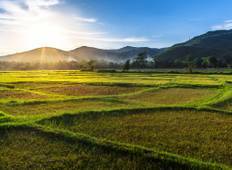 Find a Local Living trip that explores Indochina. There are 28 tours to choose from, that range in length from 3 days up to 24 days. The most popular month for these tours is May, which has the most tour departures. "Good tour We has great time with 12 days tour from North to Center of Vietnam. Our..."
"This was a fantastic tour and well worth the long journey to get to Ban Gioc. Our..."